Do you think seeing dolphins, big liners and tornadoes in one place is possible? For that one just has to visit Novorossiysk. 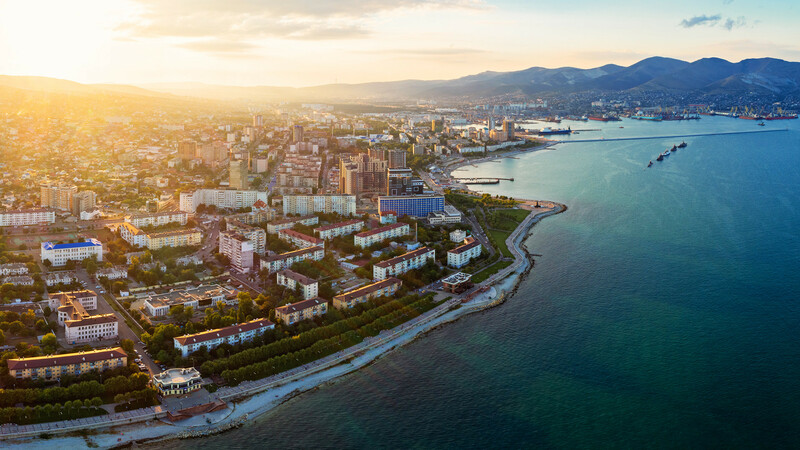 Founded in 1838 Novorossiysk (920 miles south of Moscow) is a big industrial city and the largest seaport on the Black Sea. It’s busy year round as life doesn’t stop here even after vacation season is over. Large volumes of cargo arrive here every day – all thanks to the city’s bay, which is the only deep, long and convenient one on the Black Sea coast that allows even big liners sufficient draught to berth. Although the climate is quite mild (the bay never freezes in winter) the city occasionally gets hit by tornadoes and strong winds. These so-called “bora” can reach 105 km/hour (65 miles/hour) and lead to destruction and havoc. In September 2017 the bora felled dozens of trees, damaged roofs and bus stops. Locals learn to live with such fierce conditions, but even they sometimes choose to stay at home. Home to more than 300,000 people (including a large Greek community) and hometown of Russia’s cybersecurity mastermind Eugene Kaspersky, Novorossiysk can never be dubbed boring. Despite its “hardworking” vibe, it offers many entertainment opportunities for tourists, like diving, yachting or night clubbing. Locals also love the embankment where one can find the museum ship “Mikhail Kutuzov,” formerly a Black Sea Fleet vessel that officially participated in two armed conflicts - in the Arab-Israeli war in 1967 and 1973. On the weekends the embankment and nearby beaches are the places where you’ll see the locals relaxing. Novorossiysk is one of Russia’s “Hero Cities”: in 1943 a small unit of local soldiers and sailors managed to win back around 30 sq km (18 sq miles) of land from Nazi occupying forces, and defend it for 225 days until the city was liberated by the Red Army. A monument on so-called Malaya Zemlya (small earth) commemorates their heroism and is one of the must-see sites in the city. The area of Novorossiysk is also known as one of Russia’s wine-growing regions. The winery of Abrau-Dyurso, founded by Russian Emperor Alexander II in 1870, is not far from the city and still produces famous table and sparkling wines that are today still often served at Kremlin receptions.